The heel of the Italian boot looks and feels like nowhere else in Italy: washed in dazzling light, surrounded by low white-washed buildings, and gazing onto an omnipresent blue sea which hugs the region from two sides. Colorful, exotic Puglia is a stimulating place, with its own distinctive food, architecture and atmosphere. Its landscapes have an appealingly elemental quality – stark rocks meeting clean beaches lapped by crystal-clear water; gigantic olive trees spiraling up from dark red soil fringed by vivid wildflowers; fragrant pine forests opening onto chalk-white sands. Nature’s colors are bold in Puglia, and manmade shapes are simple – with chunky, cubic houses and conical-roofed cottages dotting the countryside. You quickly get hooked on the region’s unique, striking flavor. Of course, all the best of Southern Italy is down here too – super-healthy food, open spaces, a strong sense of family and community, and an easygoing lifestyle. 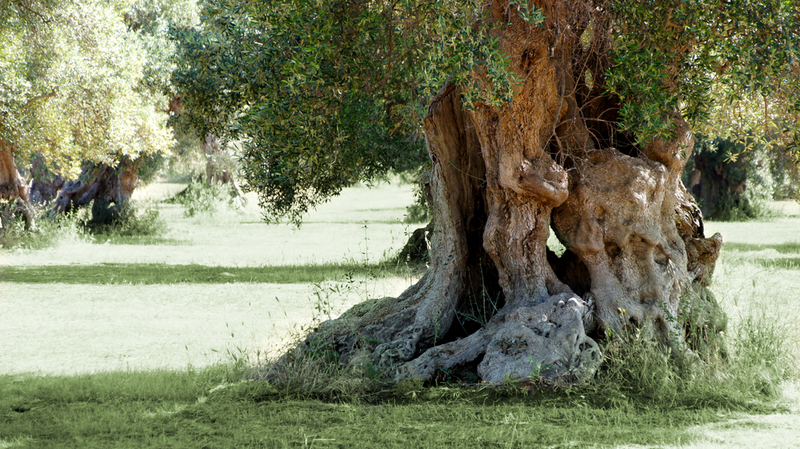 Puglia is the traditional heartland of olive oil with its twisted olive trees whose lineage stretches back centuries, in some cases even millennia. Providing 40 percent of the nation’s product, with over 60 million trees in the region (one for every person in Italy), olive oil is a tradition that inspires more Pugliese pride than any other, and with reason. Known for producing not only great quantity but also some of the highest quality olive oil anywhere, its oil-fueled gastronomy has earned a reputation as a top contender in the constant war that rages over which region has the best cuisine in the country. Our olives are picked mechanically as well as manually. For the very old (and hard) trees the olives are picked manually. Large nets are hoisted around the tree and the branches are hit with sticks in order to make the olives fall from the tree into the net. For the younger (and softer) trees the olives are picked mechanically. A mechanical jaw grabs the tree trunk and hoists a net under the tree at the same time, the tree is shaken and the olives fall in the net. The olives are washed with fresh water in order to remove all sand and dust that may have accumulated. Since we are a fully organic farm there is no need to wash out any chemicals. Any sand or dust that may be on the olive when it’s pressed may make its way into the oil, therefore a good wash is necessary. After being washed the olives are crushed by metal grinders into a paste that allows the oil to be easily extracted from the olive. Oil is naturally present in the olive and just needs to be released; there is no need to chemically alter the paste. Once the olives have been crushed and all the oil has been released, the crushed olives are mixed in order to make the oil drops stick together. Mixing time needs to be kept at a minimum as this has a tremendous impact on the quality of the oil. The final step is that of spinning (centrifugation) the crushed olives in order to separate the oil from the rest of the olive. This phase separates the crushed olives in three parts: oil, water and crushed olive. The oil is then stocked in metal barrels that allow the fine particles and some left over water to separate naturally. The oil is then bottled and ready to be used.